[1892-1932] Mabel Highley was born on 21 Dec 1892, the daughter of William Highley and Jessie Ambler of Halifax. 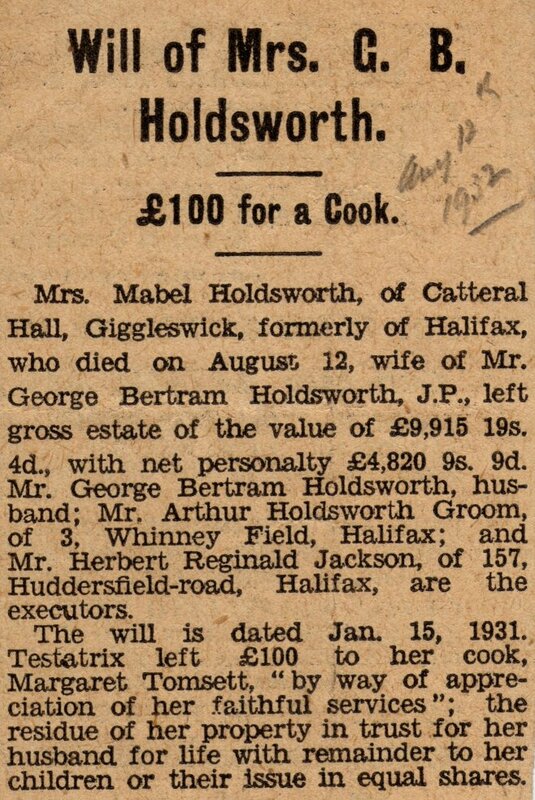 Married George Bertram Holdsworth on 3 June 1919 in Harrogate. They had three sons, John 1920, Michael 1921 and William 1922. 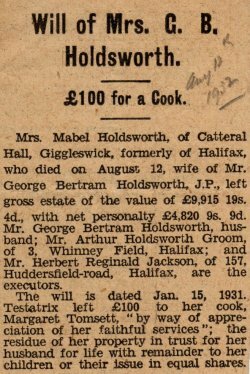 Mabel died at Catteral Hall on 12 Aug 1932. Mabel had one elder sister, Doris Highley, born 14th Feb, 1890. Mabel Highley, age 8 a niece living in the household of Edith Walker, Head, 37 widower, born in Halifax. At the date of the 1901 census Doris Highley was at a boarding school in Harrogate. William Highley's family is as follows:. William Highley's father was Thomas Sutcliffe Highley born 1836 Halifax. He married Esther ?????. Thomas Sutcliffe Highley's father was Henry Holt Highley (a card maker) born about 1809/10 in Halifax. He died after 1891. He was married to Frances Sutcliffe in Halifax on 18 June 1831. Henry Holt Highley's father was James Highley who married Ellen Settle on the 31 Jan. 1802. All the family seemed to have been involved in Card making. 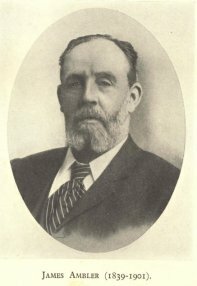 Thomas S. Highley is described as a Card Manufacturer (Spinn Mac) and as well as William had several other children. Ashton, Herbert, Gertrude, Clement and Bertram Highley. After Thomas died they came to live in Harrogate where Mabel was married. I think the family later went back to Halifax. 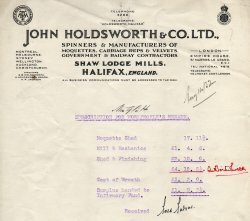 The family business was Samuel W Highley and Co, Union Mills, Pellon Lane, Halifax, worsted spinners. On Tuesday, 17th July 1900 Union Mills, Halifax was destroyed by fire causing damage estimated at £20,000. Most of the above Highleys were living in or around the Savile Park Road, Skircoat area of Halifax. Mabel's father William was living at 21 Savile Park Road in 1891. Thomas, Mabel's Grandfather was at 17 Savile Park Road and a relation of mine, Bessie Highley was living at 25 Savile Park Road. There were other Highleys just off Savile Park Rd. They must have liked the area! Jessie Ambler's family is as follows:. Jessie Ambler was born on 11 May 1868, married William Highley on 5 June 1889 and died 11 Nov 1898. Jessie Ambler had an elder brother, John Ambler, born 5 May 1865, who married Eleanora Marguerite, daughter of Taliesin Thomas of Middleton St. George, Durham, on 5 Oct 1907 at St. Marylebone Parish Church, London. John Ambler of Chalgrove, Greenroyd, Halifax was with his father (and brother William) in business at Luddenden until father's death in 1901, when he wound up John Ambler and Sons, Ltd and began business as a worsted spinner at Wibsey near Bradford. His brother had retired 10 years earlier. 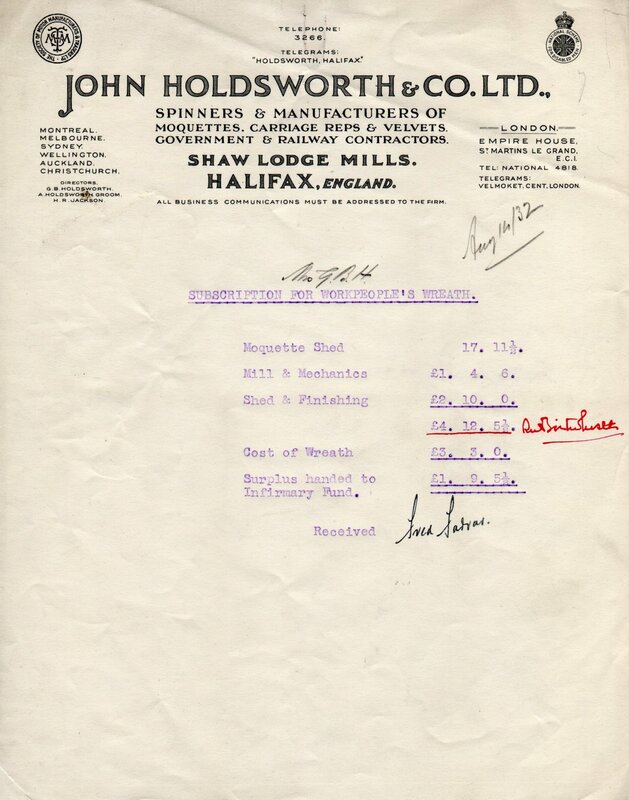 He was since 1908 a director of Samuel Webster and Sons, brewers, and churchwarden of All Saints' Halifax since 1921. Thereby Ruth Downing was first cousin of Doris Highley and Mabel Highley. John and Eleanor Ambler had a daughter Ruth Marguerite Ambler, born 19 April 1910. Ruth Ambler married Harry Downing, circa 1957 when she was 47 years old and he was 22. They had no children. Ruth Downing died 18/3/1998 in London. Harry Downing died in December 1998. Jessie's father was James Ambler J.P. of Glen Royd, Luddenden, born 16 May 1839 and died 5 June 1901. James Ambler was married in Halifax on 13 Jan 1862 to Emma Jane Webster, daughter of Samuel Webster, the famous brewer of Halifax. Formerly lived at Norton Lodge, and during his residence there erected at great cost Norton Tower and resided there for some time. James' father was John Ambler of Peel House, Luddenden, born 22 May 1795, died 16 Jan 1885 and buried at Illingworth. John Ambler was married on 14 Sept 1836 to Hannah Robertshaw. In 1834 John Ambler took Peel House Mills, Luddenden and founded John Ambler and Sons. In 1866 he handed the business to his two sons William and James. 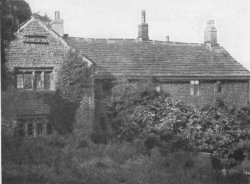 Ten years later, William retired and built the mansion Glen Royd, Luddenden and resided there until he removed to Kirby Leas, Halifax, his brother James going to Glen Royd. John Ambler's father was Stephen Ambler of Illingworth, baptised 22 Dec 1765 at Illingworth Church, and died 12 Aug 1838 and buried at Illingworth. Stephen Ambler married Sarah Smith on 8 Mar 1791 in Halifax. Stephen Ambler's father was John Ambler of Ovenden, born 31 Oct 1721, baptised 29 Nov 1721 (Oliver Heywood) and married Susan Wilson of Ovenden on 25 Mar 1744 in Halifax. Susan was buried in Halifax 22 Feb 1767. John Ambler's father was Stephen Ambler of Clayton and Shibden Head, baptised 9 May 1700 (Oliver Heywood), and buried 21 Feb 1758. John Ambler married Hannah Ramsden on 31 Jan 1720 at Halifax Church. Hannah was buried 24 Nov 1765 at Halifax. Stephen Ambler's father was John Ambler of Shibden Head, Northowram, baptised 10 Dec 1665 and died 17 Mar 1732. John Ambler married Anne Hurd of Hipperholme on 25 June 1696. Anne died 26 Mar 1736 and noted in Oliver Heywood's diary "Good Anne." John Ambler's father was John Ambler of Hazelhirst, Northowram, baptised 8 April 1632 in Halifax, buried 17 Dec 1714 in Halifax and married on 14 Jan 1664 in Halifax to Anne Illingworth, who was buried 24 May 1701 in Halifax. John Ambler's father was John Ambler of Northowram, baptised 16 Sept 1610 in Halifax, who married Barbara Shaw of Southowram on 9 May 1631 in Halifax, and who was buried 4 Mar 1640(/1641) in Halifax. John Ambler's father was William Ambler of Shelf and Hipperholme, baptised 15 July 1582 in Halifax and buried 9 April 1624. John Ambler married Sara Susanna who was baptised 25 Feb 1588(/9) in Halifax, and buried 9 April 1624 in Halifax. William Ambler's father was William Ambler of Northowram, baptised 1 Aug 1547 in Halifax and married on 25 Oct 1574 to Sybell Butterfield. Sybell was buried 11 May 1602 at Halifax. William Ambler's father was John Ambler of Northowram, who paid heriot on death of his father John 1519 and brother, Richard 1534. (In late Medieval England, English law demanded that when the head of the family dies the family must pay heriot, or death tax, to the liege lord. John Ambler's father was John Aumbler, Constable of Northowram in 1470, and dead in 1519. 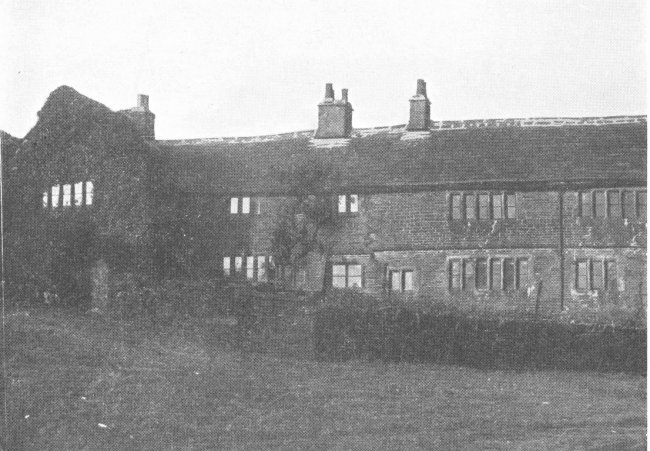 John Aumbler's father was William Awmbler of Northowram, who surrendered land in Hipperholme in 1431, and who was on Special Jury in Brighouse Court in 1431. 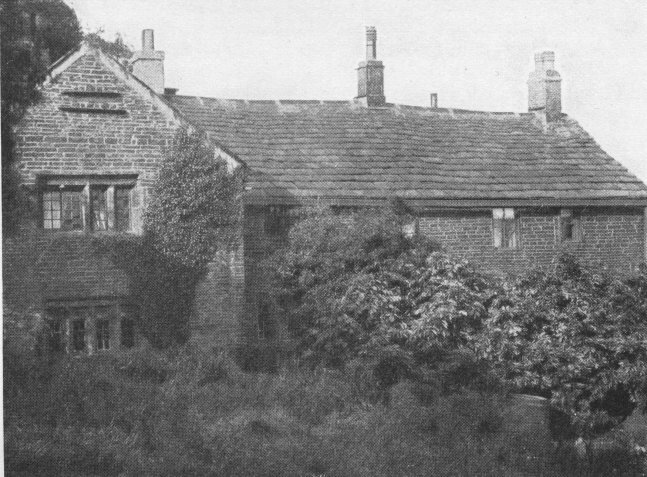 William Awmbler's father was John Aumbler of Northowram who had Shibden Mill (Shepdene) in 1351, and had land in Northowram, Hipperholme and Sculcotes near Halifax. Surrendered land to his sons in 1409. John Aumbler's father was Robert Aumbler, brother of John le Aumbler who held land near Halifax in 1333. 1333 Brighouse Court (J.Horsfall Turner's "History of Brighouse, Northowram, etc.") John de Godley disputed with Thos. de Lasci (Lacey) about an oxgang (an oxgang or bovate was the same as 15 acres) held by John le Aumbler. Robert Aumbler's father was Nicholas le Aumbleour who held land in Bentleyroyd, near Halifax, in 1307. 1307 Nicholas le Aumbleour give 6d. to take to himself and his heirs 2 acres land in Bentleyrode, which William de Saltonstall left waste on the Earl 12 years ago.